Free Outdoor Summer Concerts! Bring a blanket or a chair to enjoy an evening of live entertainment at our local town green. Fun for the whole family!In the event of rain, shows will be cancelled. Call the HK Recreation Hotline at 860-345-8334 in case of inclement weather or visit www.hkrec.com. Leaf Jumpers play the best of the 90’s and 2000’s adult rock. Bands like U2, REM, Counting Crows and many others that all ages will love. They have played all over the East Coast from Maine to Georgia on some of the biggest and well known stages. They have also released 3 full length albums and a live album.Visit www.leafjumpers.com. L&B All-Star Review is a CT based band made up of a trio of seasoned musicians playing “Rockin’ Country and Blues”. They feature strong vocals, wailing harmonica and tasty guitar licks. They will get the crowd moving with upbeat, tap-your-feet, clap-your hands, get-up-and-dance song selections. L&B covers a wide range of music to satisfy a variety of musical tastes. Check out www.LBAllStarReview.com. 1974 is an award-winning rock band that has been dazzling audiences with rich vocal harmonies, punchy guitar riffs and live performances reminiscent of the classic rock era. On stage, charismatic band personalities meld to create dramatic, high-energy shows that are enthralling to watch. Their expansive set lists features artists like Pink Floyd, Boston, Kansas, Rush, Queen, and Styx along with their own massive catalogue of original material. Acclaimed for their powerful sound and distinct imagination, it is no wonder 1974 has been described as “truly huge,” and “epic sounding”. Visit www.1974online.com. Rotary is a four-piece Classic Rock band from Central CT. For over a decade they have played a multitude of venues with notable performances including opening for The Guess Who at the Durham Fair, a set with the Monkees’ Peter Tork, and the Mohegun Sun Summer Concert Series. Rotary’s set includes an ever-expanding catalogue of artists including the Rolling Stones, Billy Joel, Cream, the Beatles, Eric Clapton, Dire Straits, Creedence Clearwater Revival and many more. They deliver great music and a dynamic, crowd-pleasing show every time. Check out www.facebook.com/RotaryBand. The HK Recreation Department has booked some fun shows this summer. Children enrolled in our Summer Camp will be attending free of charge. All shows are $4 per person payable at the door and are at the HK HS Auditorium. Bryson Lang has been working professionally as a comedy-juggler for over 20 years. Through long-term casino show runs, night-clubs, corporate shows, theaters and cruise ships he has combined technical juggling skills, creative physical manipulation and original comedy into a unique and unforgettable act. See a likable, energetic personality performing inventive and clever routines that mix comedy, audience participation, ball spinning, ball bouncing, fire-juggling, well-crafted timing, sharp sickles, huge spinning bouncing rings, giant Beach Balls, improv, glo-in-the-dark objects and always a few surprises. Come see why Bryson is, “The Cure for the Common Show”! Having appeared on the “CBS Early Show”, Universal Studios’ City Walk and Sesame Street’s “Fun to be One” celebration, Magic by George’s fun-filled show will keep everyone on the edge of their seats. Be thrilled by Live Birds and the actual levitation of an audience member. With lots of audience participation and family fun humor, everyone will leave wanting more. For the young and old alike! Great Show and Great Fun! Visit www.magicbygeorge.com. Be amazed by the talents of a diverse group of Animal Ambassadors that build complicated structures. In nature, many creatures contribute to the success of others by building homes and creating places to rear their young. We’ll study the architectural feats of nest building, burrow making and web spinning as well as how structures created by some animals help others to survive. We’ll explore how we too can help our wild neighbors by building bird boxes and frog ponds. Meet live Animal Ambassadors such as a Red-Foot Tortoise, a Monk Parakeet, a Chilean Rose-Haired Tarantula, a Ferret, an Argentinian Horned Frog, and an African Porcupine. We will also see artifacts & photographs representing one of nature’s most prolific builders, the Beaver, along with Bird & Paper Wasp nests. And together, we’ll draw parallels with our own lives while exploring how we can build a better world! 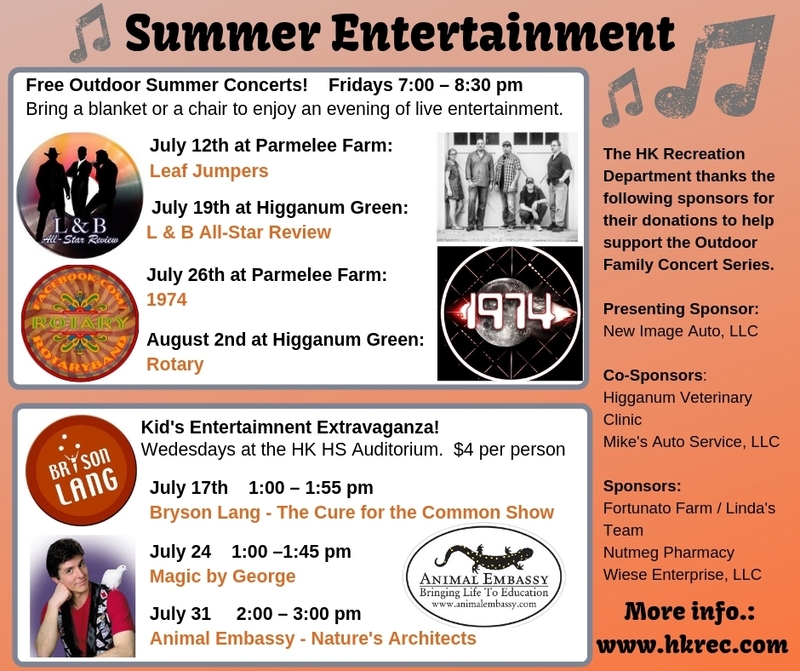 The HK Recreation Department thanks the following sponsors for their donations to help support the Outdoor Family Concert Series.